For whatever reason, mussels have always been one of those dishes I order at restaurants but never contemplated making at home. That is, until B sent me this article the other day about cooking mussels on the grill and it looked so delicious we had to try it. It turned out to be so easy (and fancy-looking), we wondered why the hell we never did this before! B came up with two types, based on some of our restaurant favorites, and the smoky flavor of the grill lent itself well to both. Hope you enjoy! 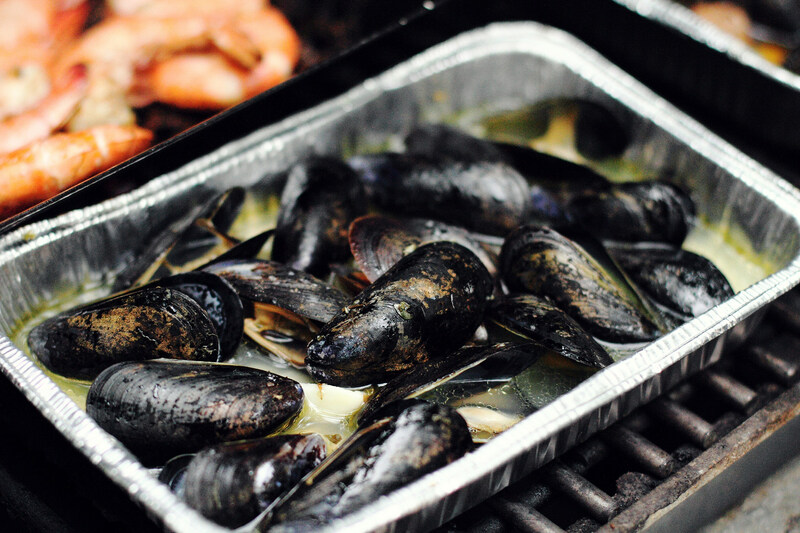 Put mussels, wine, garlic, oil, salt and pepper in a disposable aluminum roasting pan and stir. Cover pan tightly with heavy-duty foil. Place pan on the grill and cover. Let cook for 6-10 minutes until mussels are done and completely open (don’t forget to discard any mussels that fail to open). Transfer mussels to bowl along with their juices and sprinkle with fresh parsley if you like. Serve with grilled bread brushed with olive oil for dipping and enjoy! 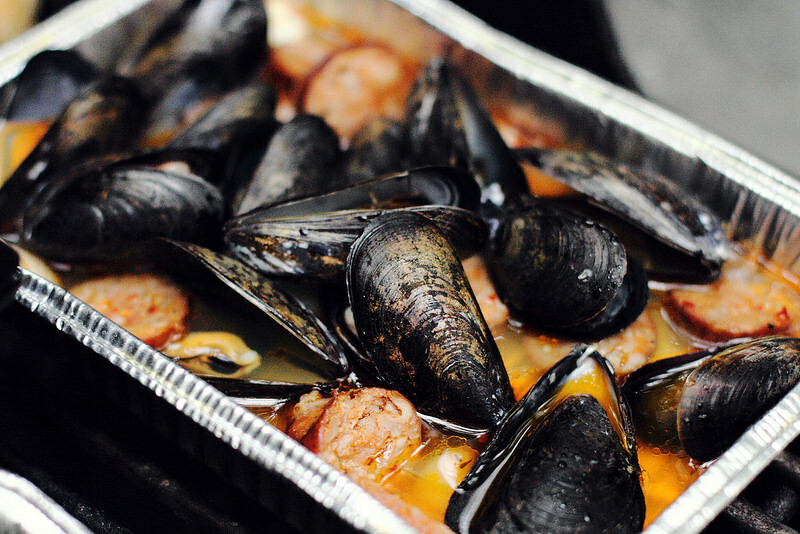 Put mussels, beer, sausage, oil, salt and pepper in a disposable aluminum roasting pan and stir. Cover pan tightly with heavy-duty foil. Place pan on the grill and cover. Let cook for 6-10 minutes until mussels are done and completely open (don’t forget to discard any mussels that fail to open). 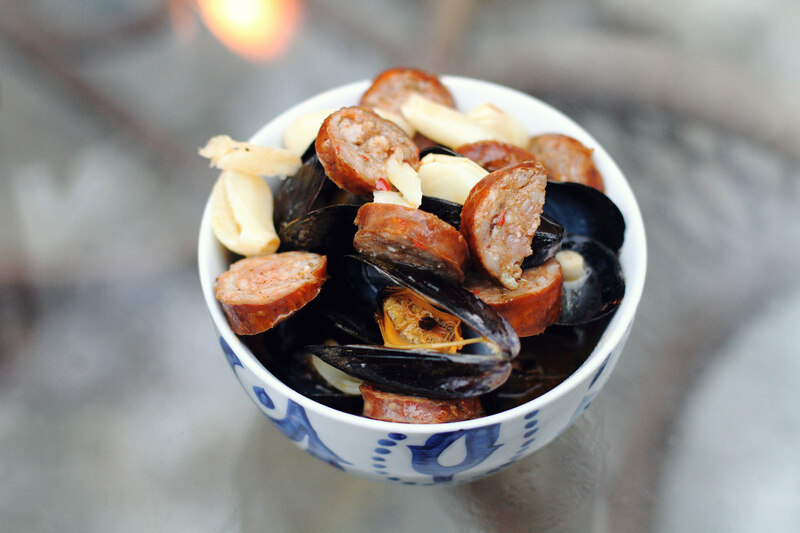 Transfer mussels to bowl along with the remaining liquid and sausage. Serve with grilled bread brushed with olive oil for dipping and enjoy! oh my these looks SO good! I love mussels! 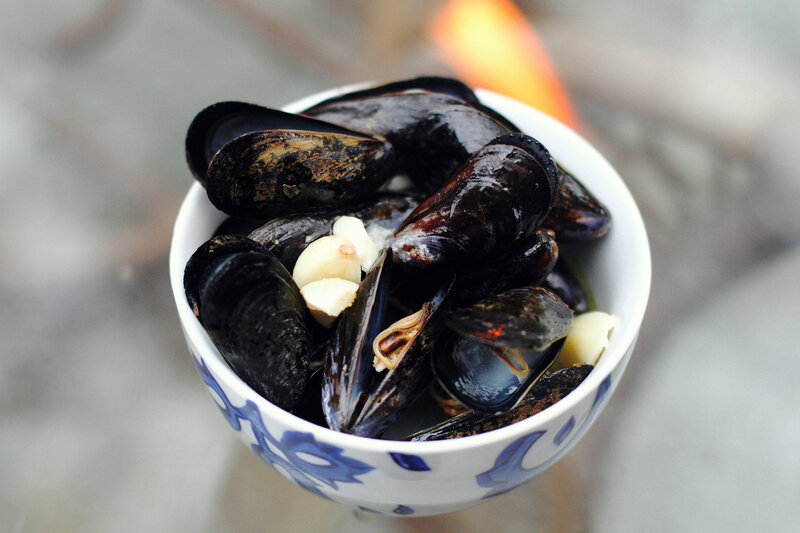 Thanks for sharing these awesome mussel recipes! I love mussels! I would like to eat the traditional "White Wine and Garlic Mussels" dish. Oh wow, this looks so good! Thanks for sharing the recipe! Oh wow!! This sure looks yumm and seems like an easy recipe to nail. Thanks for sharing. Oh wow, these look absolutely delicious! Thanks for the recipe! Nice food, WOW 🙂 Bisous from France, Sand. Mussels sound so easy to make at home. I had thai mussels with coconut milk, curry and cilantro. They were fantastic. I love mussels! Can't wait to try this! 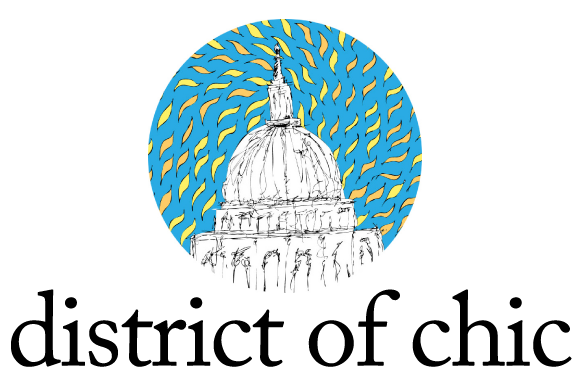 I have to tell you, there is a shop in Union Market that I don't eve think has a name (they don't have signage!) that has the most incredible smoked mussels. It's to the right of Peregrine. Anyway, they serve them in the shell, warm, with the most delicious smoky flavor to them. And they're only $.75/each. I had them for the first time about a week ago and I have not stopped thinking about them since! Thank you so much for telling me! You had me at $.75/each!